Pottsville Junior High School: Highlights - 2017 National Beta-Orlando Fl. 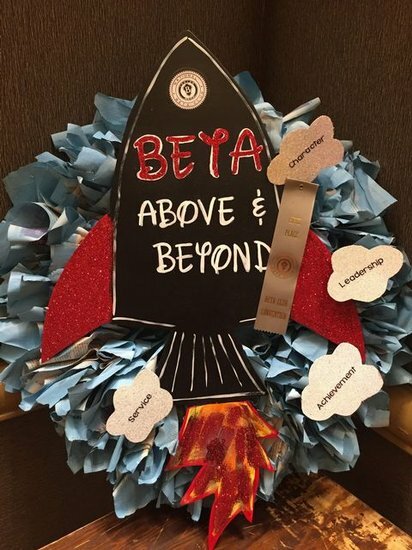 The National Beta results are in and Pottsville has claimed its first National Champion award. Both Pottsville Junior High and High schools were represented at the National Convention in Orlando, FL this summer. Students and sponsors were able to spend time competing at the convention and when not in session they were able to visit the happiest place on earth - Disney World. Pottsville Junior High student, Caden Hull, won the National Champion award for Essay Writing for Division 2 of the Jr. Convention (Division 1 is 4th-5th and Division 2 is 6th, 7th, and 8th grades). 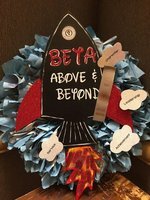 For the competition, Beta students were asked to write an essay (up to 1000 words) based on the National theme - Beta Above and Beyond and submit their essays for the state competitions. Out of the 21 states, each is eligible to send the top three essays and Hull’s essay came out on top in this year's competition at both the state and National levels. The essays are scored with a rubric-based assessment of the following areas: Purpose and Focus, Organization and Development, Structure and Language, Mechanics, and Overall Effectiveness. Deductions can also be taken for not meeting guidelines such as writing less than 600 words or more than 1000 words. The winning essay was given a perfect score by all judges at Nationals. Hull says he was proud of his work and appreciates the recognition for his school and teachers as they all play a part in his level of skill in writing. Also earning a National award was Brenlee Barton who earned a 4th place for her wreath design. Barton has a family tradition of creating wreaths that were started by her older sister about six years ago. In a statement from Barton, she tells us that she “did’t expect to place because of the huge, beautiful wreaths from so many other competitors.” Barton was also recognized as a National Finalist in for the John W. Harris scholarship award. She was nominated by her school sponsor and was among only 25 finalists recognized throughout the nation. Also, attending were members of Pottsville High School Senior Beta Club. A team of four freshman girls was a strong force in the “Fresh Look at Beta” competition. Senior member, Caleb Hull placed 6th in the Social Studies Division II competition.